Each of these knives was hand-forged in my shop from either O-1, A-2, 5160 or high-carbon damascus steels, though I work in other alloys as well. Every knife is hand finished, ground for superior sharpness and tested for toughness. Domestic and imported hardwoods were used in the handles and each knife comes with a leather, wood or mixed material sheath. Do you have a particular knife in mind? I can also forge a blade and assemble a knife of your vision and design, including blades of modern stainless alloys with durable modern handles and sheaths. I especially enjoy recreating historic knives and I'm happy to work from your design OR historic text. I also offer a number of differnt finishes, depending on your taste or need for historic realism. A note on custom knives: You choice of knife design and construction should be dictated by the service you intend to put the knife in. For example; a sailor might want a stainless blade or a survivalist might want extra-strong scale-tang vs. hidden tang construction. These are but a couple of considerations, but the old maxim the "right tool for the job" really applies to knives, the most personal of all tools. Lets' talk about your needs! Ordering: We're trying to get Paypal online, but we're happy to take your "Square" transaction, check or money order. If your knife is a custom order, a 50% deposit is required in advance. Currrently, waiting time is about 6 weeks from receipt of your order and specifications. All knives come with a lifetime warranty when used in their intended manner. 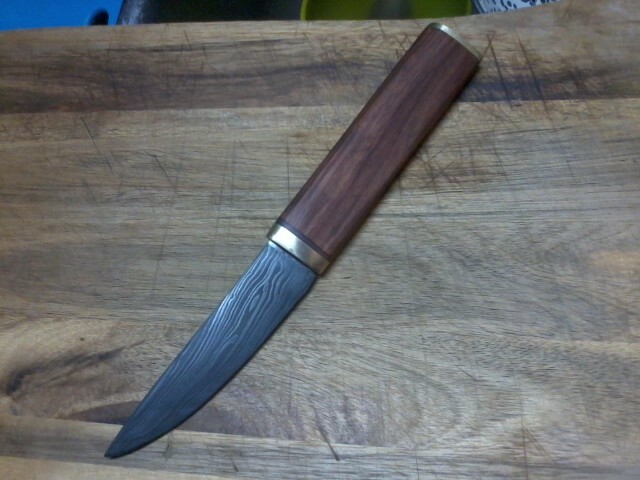 We will repair or replace your knife at our discretion.